Arnott and Vederoff Ancestors - Isaac Bottenfield Headstone, Section 1, Row 6, Antioch Cemetery, Antioch, Monroe County Ohio. American flag flys by headstone in honor of his military service during the Civil War. 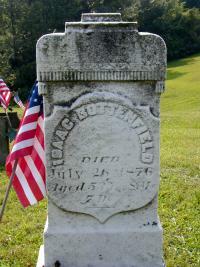 Isaac Bottenfield Headstone, Section 1, Row 6, Antioch Cemetery, Antioch, Monroe County Ohio. American flag flys by headstone in honor of his military service during the Civil War.